Ostia was founded at the mouth of the river Tiber as a walled military fort, a castrum, in the 4th century BC. The castrum area is now the city centre of Ostia, in which the forum is located. From here, the city and street-grid emanated through the centuries. However, one street already existed in the area before the foundation of the castrum, and that is the street running from the south-east to the north-west towards the Tiber mouth. This street was divided in two by the south-west corner of the castrum walls, and the two streets are today known as the southern Cardo (the south-east street) and the Via della Foce (the north-west street). The main area of this study is the city centre with a focal point on the forum’s area. Until now, it has not been possible to study the forum as a coherent unit put in a diachronic perspective. Recent research conducted by the Berlin-Kent-Ostia Excavations, Humboldt-Ostia-Forum Project and Ostia-Forum-Project in the period between 2008 and 2016 have provided evidence of the development of the forum. The research has been conducted through excavations, photogrammetry and geophysical analyses. Before these comprehensive analyses, excavations have never been conducted in the forum’s area since the rigorous excavations in the first half of the 20th century. It is therefore, for the first time, possible to analyse, contextualise and trace several different orientation and planning symmetries of different building layouts in the attempt to interpret the genesis of the different forum-layouts. The Roman city was not achieved overnight, but is a result of earlier accumulation and production. It is therefore even more important to analyse the hitherto unknown forum phases, due to the fact that they can provide evidence of the development of Ostia from late Republican times until Late Antiquity. Urban space and layout often reflect the society, which thus inform us about social structure, monumental access, urban economy, traffic-flow and -intensity etc. In this project, I propose the idea of tracing more than seven centuries of urban evolution from middle Republican to late antique times in Ostia’s city centre by analysing the orientation and planning symmetries of different building-layouts based on the newest 3D-measuring techniques and geophysics applied to Ostia by the Ostia-Forum-Project (OFP) and its predecessors in 2010-2016. The aim of this project is to interpret the genesis of the layouts and visualize their function and sequence as a “Harris Matrix”. The results will be used to analyse the urban space and urban society using the latest theories from Roman urbanism. 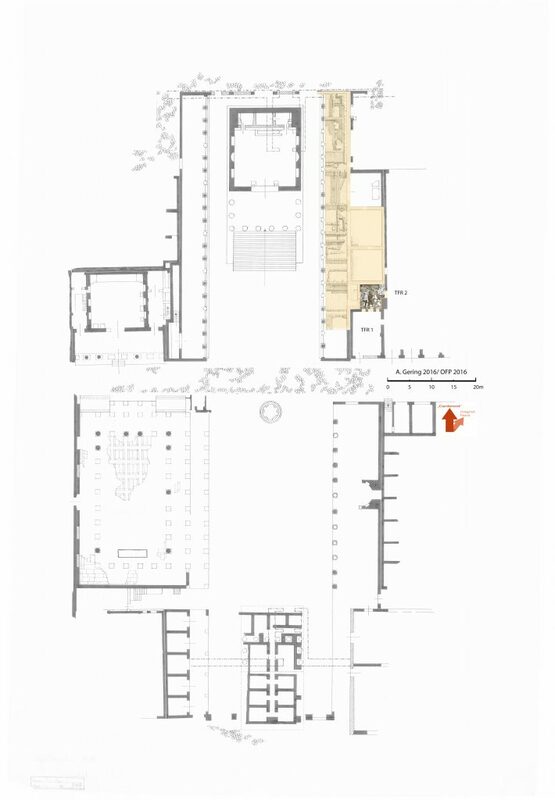 By studying the urban space of the forum, we come to understand the social structure of the forum – also in a period previously thought to be a shortfall compared to Pompeii. The forum was the centre of activity, and all the major through-routes led to this area. A focus on individual building histories has hindered a more complete picture of the forum and its surroundings. In the second half of the 20th century, the focal point has been on the remaining city with topics such as burials, art and architecture. This is not an isolated Ostian phenomenon. Archaeologists and historians have for decades focused on building activities as evidence for an interpretation of certain political and economic trends, rather than focusing on its built environment. However, in recent times, a shift in perception of the urban space has been inaugurated – also in Ostia. The approach of this study is to perceive the forum as an inhabited space rather than a collection of different individual buildings. The ph.d. project is conducted by Daniel Damgaard.